Do you have experience working with Deloitte Digital? Do they deserve to be on the top of the Best Web Design Companies list? What do you think of Deloitte Digital? Leave a comment below. 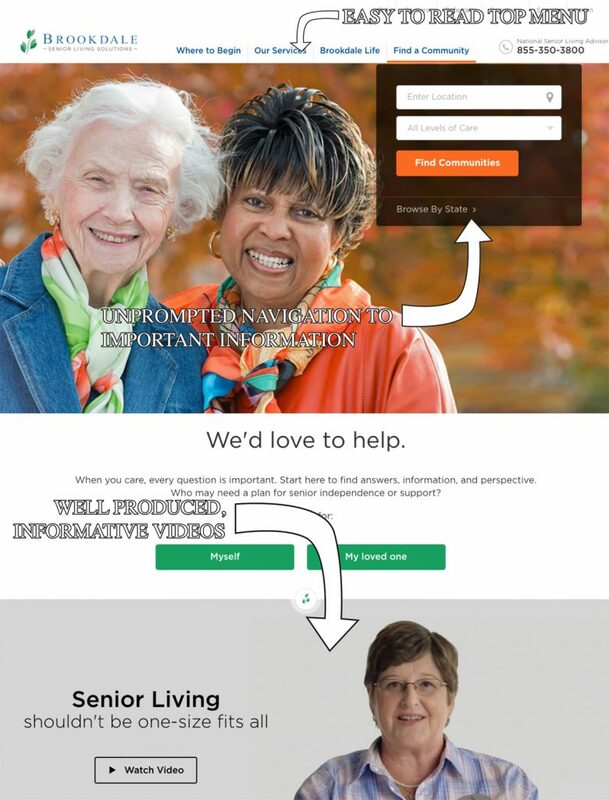 When Brookdale Senior Living Solutions decided to redesign their website, they had one thing in mind: the user. They felt their old design focused too much on who they were as a senior living facility, and not enough on who their target audience was and the information and services they needed easy access to. Deloitte Digital helped Brookdale with the overhaul, and the results speak volumes about how they handled the work in terms of design efficiency and user experience ingenuity. That work is evident as soon as you land on Brookdale’s front page. Unprompted, a dropdown menu appears from the “Find a Community” tab that lets you input your address and immediately locate facilities in your area. Based on feedback Deloitte received during their research, this was the most important bit of information users had difficulty tracking down with the previous design. The rest of the top menu is easy to read, and points you in every direction you might want to go to find out more about the company and what they offer. From a design standpoint, Deloitte made a point to understand who the primary user is. Large, easy to read text and navigation buttons populate the front page that also includes several informational videos and highlights of their specialized programs. The design is clean, effective, and without any major hiccups that would hinder the user experience from an aesthetic or organizational standpoint. The remainder of the site is informational and consistent. Everything a prospective guest would need to know is readily available at a single click from the front page, which is a critical component of a website that understands how people use the internet. Our one critique is the “Our Services” and “Brookdale Life” top menu items are a bit similar in the information the offer. This could have perhaps been consolidated into a few more pages with more focused copy. In the grand scheme, however, this is a minor gripe. How did Deloitte Digital fare on the mobile side? Unfortunately, the only thing holding Deloitte’s redesign back is an unimpressive speed test. It’s not the worst score you’ll ever see, but there’s definitely room for improvement. It should be noted, we didn’t experience any lengthier-than-normal loading times in our experience with the site, but that doesn’t always tell the whole story. This test is a small blip on an otherwise impressive showing from Deloitte Digital. Overall, the Brookdale website redesign performed well in almost every category. The clients expectations for a better, more intuitive user interface were met and surpassed. An average speed test score is the only thing standing between this site and a perfect Best Web Firms score. Deloitte delivered a final product that is not only easy to use, it is attractive, inviting, and worthy of our highest praise.